135 Commonwealth is located on the north side of Commonwealth, between Clarendon and Dartmouth, with 133 Commonwealth to the east and 151 Commonwealth to the west. 135 Commonwealth was designed by Snell and Gregerson, architects, and built in 1878 by Webster & Dixon, builders, one of two contiguous houses (133-135 Commonwealth). 135 Commonwealth was built as the home of banker Francis Jaques and his wife, Caroline Louisa (Merriam) Jaques. 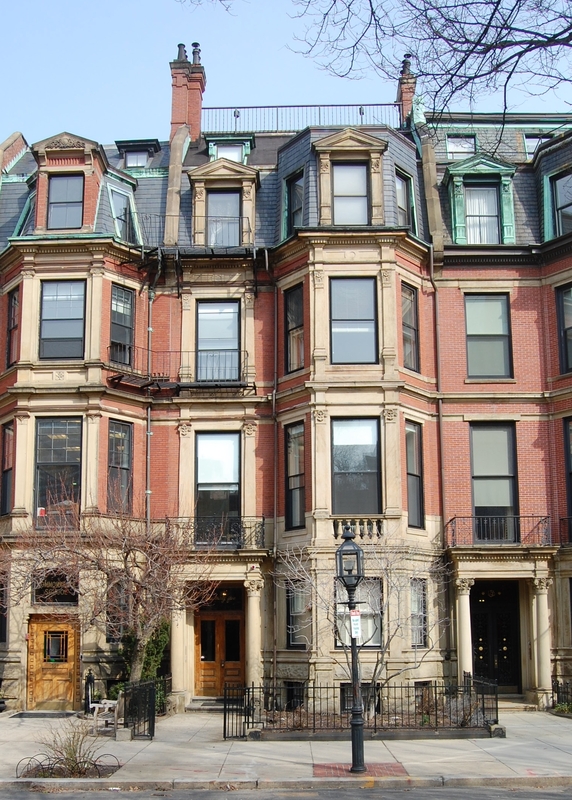 They previously lived at 83 Boylston. He is shown as the owner on the original building permit application for 135 Commonwealth, dated April 20, 1878. Francis Jaques purchased the land for 135 Commonwealth on February 28, 1878, from Marie Antoinette (Hunt) Evans, the wife of rubber manufacturer Robert Dawson Evans. 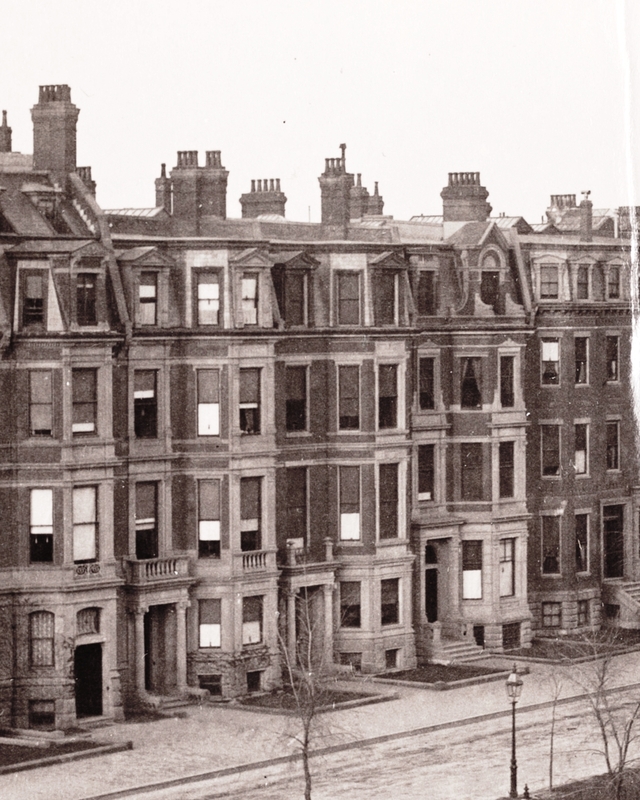 They lived at the Hotel Berkeley (southeast corner of Berkeley and Boylston) and would later live at 324 Beacon. Marie Antoinette Evans had purchased the land from the Commonwealth of Massachusetts on December 22, 1874. One week before Francis Jaques purchased the land for 135 Commonwealth, his brother, New York banker Henry Lee Jaques, purchased the land at 133 Commonwealth. On April 1, 1878, they entered into a party wall agreement governing the soon-to-be built wall between the two properties. Henry Jaques then sold the land at 133 Commonwealth on June 7, 1878, to William and Fanny (Pickman) Wharton, who built their home there. Click here for an index to the deeds for 135 Commonwealth. Francis Jaques was a banker, first in Framingham and later in Boston, where he was president of the National Webster Bank. Francis and Caroline Jaques’s five children lived with them: Alice Jaques, Henry Percy Jaques, Herbert Jaques, Eustace Jaques, and Helen Louisa Jaques. Herbert Jaques, an architect, married in April of 1883 to Harriet Sayles Francis. After their marriage, they lived in Chestnut Hill. Francis Jaques died in December of 1884. Alice Jaques married in November of 1885 to Arthur Lovell Ware. After their marriage, they lived in Milton. Caroline Jaques and her unmarried children continued to live at 135 Commonwealth during the 1885-1886 winter season, but moved thereafter, probably also to Milton. On May 6, 1886, 135 Commonwealth was purchased from Francis Jaques’s estate by Isabel (Gourley) Thacher, the wife of George Thacher. They previously had lived at 14 Mount Vernon Street. 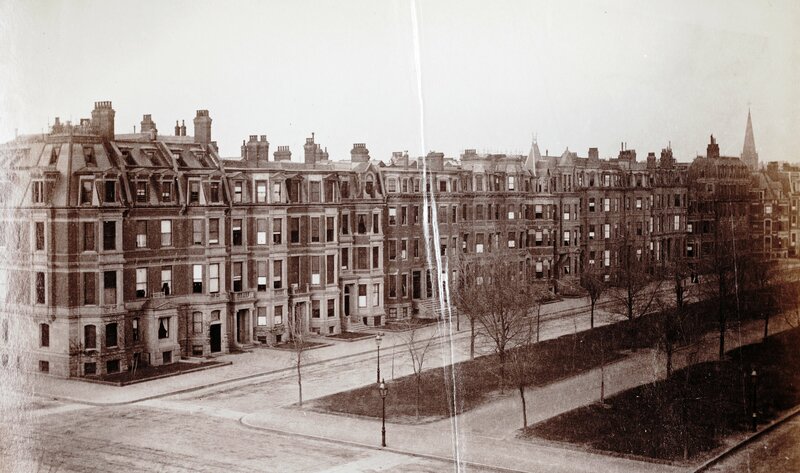 The Thachers continued to live at 135 Commonwealth during the 1897-1898 winter season, but moved thereafter to The Holland at 50 Commonwealth. 135 Commonwealth was not listed in the 1899 Blue Book. On June 22, 1899, 135 Commonwealth was purchased from Isabel Thacher by Frances Spofford (Hall) Russell, widow of William Augustus Russell, and their son, William Augustus Russell, Jr. William Augustus Russell, Sr., had been a paper manufacturer and US Congressman; prior to his death in January of 1899, they had lived at 35 Beacon. They also maintained a home, Lakeview Farm, in North Andover. William Augustus Russell, Jr., was associated with his father’s business and, after his death, assumed responsibility for its management. William Augustus Russell’s brother, Richard Spofford Russell, also lived at 135 Commonwealth. He was a student at Harvard and graduated in 1901. In October of 1901 he married Mary Gertrude Sutton; after their marriage, they moved to 435 Beacon. Soon thereafter, they built a home, Oakland, in North Andover. On September 11, 1901, William Russell transferred his interest in 135 Commonwealth to his mother. In 1902, William and Richard Russell formed the investment banking firm of William A. Russell and Brother to manage their family’s manufacturing and mining interests. By 1903, Richard and Mary Russell had moved to 135 Commonwealth to live with his mother and brother. By the 1905-1906 winter season, they had moved to 386 Beacon. William A. Russell, Jr., married in September of 1905 to Mary Lovering Head. He died in June of 1906. 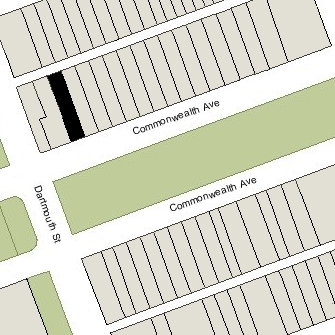 Frances Russell lived at 135 Commonwealth during the 1905-1906 winter season but moved thereafter, possibly to Milton where she was living at the time of the 1910 US Census. During the 1906-1907 winter season, 135 Commonwealth was the home of poet Amy Lowell. On June 28, 1907, 135 Commonwealth was purchased from Frances Russell by Rodolphe Louis Agassiz. He and his wife, Maria Dallas (Scott) Agassiz, made it their home. They previously lived in Hamilton, where they continued to maintain a home. Rodolphe Agassiz was president of the Calumet and Hecla Consolidated Copper Company, founded by his father, Alexander Agassiz. On May 28, 1926, Rodolphe Agassiz transferred the property to his wife. 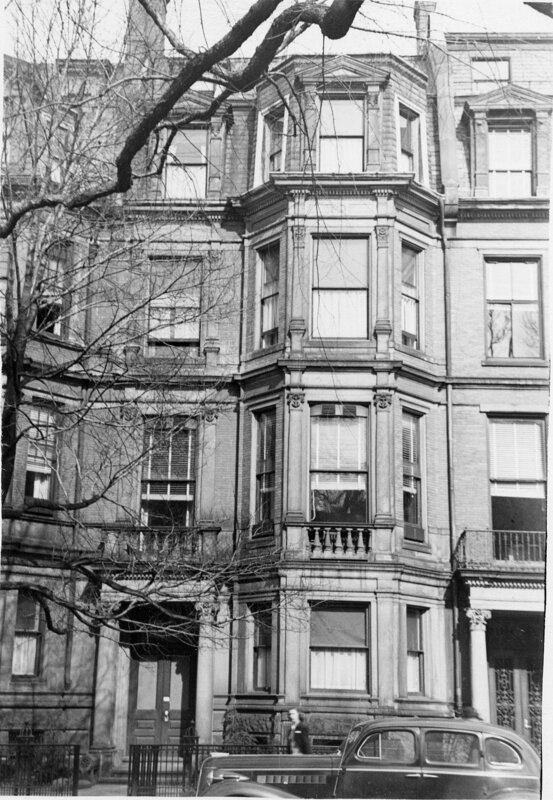 Rodolphe and Maria Agassiz continued to live at 135 Commonwealth during the 1926-1927 winter season, but moved thereafter to an apartment at 282 Beacon. On August 30, 1927, 135 Commonwealth was acquired from Maria Agassiz by real estate dealer Elliott Henderson, and on September 1, 1927, it was acquired from him by the Katherine Gibbs School. The school already owned 151 Commonwealth next door, which it had acquired in September of 1924, 90 Marlborough, and 92 Marlborough. In October of 1930, it acquired 303 Dartmouth, immediately to the west of 151 Commonwealth, and in August of 1936 it acquired 21–23 Marlborough. In January of 1946, the school cut through doors between 135 and 151 Commonwealth on the second, third, fourth, and fifth floors (doors already were cut through between 151 Commonwealth and 303 Dartmouth). In mid-1953, Katharine Gibbs School acquired 6 Arlington to consolidate its operations in one location. On August 31, 1953, 135 Commonwealth was acquired by real estate dealer Thomas J. Diab’s Baid Realty Corporation (Baid being the reverse spelling of Diab). At the same time, he also acquired 151 Commonwealth, 303 Dartmouth, 90 Marlborough, and 92 Marlborough from the school. The school retained 21-23 Marlborough, converting them from dormitories to classrooms. In September of 1956, Thomas Diab applied for permission to have Miss Allen’s Modeling and Finishing School occupy 135 Commonwealth. The school was located at 45 Hereford and operated by John Breining and his wife, Ruth Y. (Allen) Breining. His application was denied and his appeal dismissed by the Board of Appeal in October of 1956. On April 1, 1957, 135 Commonwealth was purchased by the Breinings. They lived in Cohasset. They applied to use the house for the Miss Allen’s Back Bay School of Modeling, and were granted permission to do so because the school had obtained the necessary charter under State law. In 1958, they converted the third, fourth, and fifth floors as a dormitory for female students. Miss Allen’s continued to be located at 135 Commonwealth in 1960, but in December of 1960 the Breinings purchased 304 Beacon and moved the school there. On October 26, 1960, 135 Commonwealth was purchased from the Breinings by Margaret M. Flynn. Based on the 1960 and 1961 lists of residents, it appears that it was operated as a lodging house. On August 15, 1961, 135 Commonwealth was acquired from Margaret Flynn by Chamberlayne School and Chamberlayne Junior College. In December of 1961, it applied for (and subsequently received) permission to change the occupancy from school uses on the first and second floors and dormitories on the third, fourth, and fifth floors, to dormitory use on all floors. In the mid-1970s, Chamberlayne went bankrupt, and on March 6, 1975, it sold 135 Commonwealth to John H. Baehrend and his wife, Sandra A. Baehrend. That same month, they applied for (and subsequently received) permission to convert the building into seven apartments. 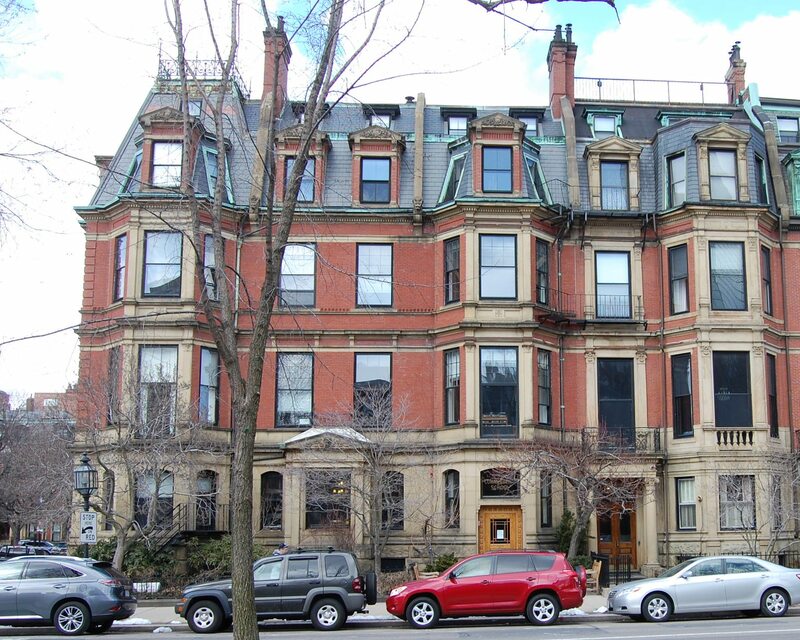 On September 2, 1980, the Baehrends transferred 135 Commonwealth to the Sandee Corporation (of which Sandra A. Baehrend was President and Treasurer), and on September 11, 1980, it converted the property into seven condominium units, the 135 Commonwealth Avenue Condominium.